Cable television is one of America’s favorite pastimes, but free online TV has picked up steam as consumers continue to seek ways to get what they want for less. There are a number of ways to get free TV shows online (and on a TV), but finding quality service isn’t always easy. Additionally, some premium shows are not available for free, but can be found for a decent deal through a number of On Demand services. Hulu – The widest collection of legal online TV shows and movies makes Hulu a online TV favorite, but talks of networks (like Comedy Central) pulling out to make more money threatens its future. Network Websites – All the major networks (ABC, NBC, Fox, CBS) offer shows online for temporary viewing. Netflix – If you have a Netflix subscription you can choose from a wide range of free streaming shows and movies. The selection tends to be older movies, but there are some gems like the entire LOST series and movies from Starz. March Madness On Demand – Catch all the march madness games for free online or download the iPhone app ($9.99) for the games to go. YouTube – Finding quality programming may be hard, but there are plenty of entertaining movies on YouTube to last a lifetime. For the shows that you can’t find for free. Check out these online services with on demand programs. It’s a great way to catch up on missed shows or to help replace cable altogether. Amazon Unbox On Demand – Offers a number of cable channels like TLC, Discovery, TNT, and FX plus a wide selection of movies in SD or HD. iTunes – The service that leads the online music market is trying to lead the way in online TV and Movie sales too. Use iTunes for easy portability to your iPod or AppleTV. While watching free TV online is cheap, connecting the online services to a TV provides for a more comfortable viewing experience. Check out these services that help bring free and cheap online programming to your living room. Roku – I tried this small DVR style box as part of a free trial and like the concept. 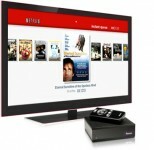 Allows you to easily connect Netflix, Amazon Unbox, and Pandora accounts to a TV. Tivo – Although Tivo is known for its DVR service, the company is pushing its ability to stream Netflix and Amazon accounts to your TV. You still have to pay monthly service, but cable isn’t required since you can record over the air signals with an antenna. Networked Blu Ray – Some Blu Ray players now offer services similar to the Roku like Amazon Unbox and Netflix. Gaming Platforms – The PS3 and XBox now have ways to connect to Netflix and the Wii is adding compatibility soon. Networked TVs – Vizio, LG, and Sony are setting a trend where HDTVs will start connecting to the internet. Sezmi.com – I heard about this website from consumer advocate Clark Howard. The service is similar to Tivo but promises discounted cable channels over the internet. Too bad it’s not widely available yet. Laptop – There are cords available to connect most laptops to most TVs. This is cheaper than buying a box like the Roku, but a little more hassle. Read somewhere that free online TV wont be free for long if cable companies have their way. May have been on the cover of Money magazine. Can’t remember.